Will Congress be there when we need them? So let’s see, the housing market is going to hell. The tax base for that market is also going to take a dive. State governments are going to be in trouble. Revenues counted on are not going to be there as projected. Let’s move to the Federal Government. Everything is moving off shore. The tax base has to be less than last year and the projection was for a better year this year. Transfer payments for Social Security, Medicare and Medical are increasing. There is that giant sucking sound coming from Mexico (A Ross Perot metaphor) is there a solution in sight? Think about it from a Congressman’s point of view. 40% of his constituents are Republican, 40 % are Democrat and 20 % are lunatic fringe elements. (I classify lunatic fringe as people that vote left or right on one issue only, i.e. gun control, abortion etc). Divide all of these figures in half and you have the actual voters. So we have about 20% Republican, 20%, Democrat and about 10% hanging from the ceiling. Let’s figure that you got elected to Congress. You want to get re-elected, who do you cater to? Answer: the 10% hanging from the ceiling; gays, lesbians, abortionist, pro life, gun fanatics, anti war demonstrators. What don’t you touch? Answer, the “Silver Foxes (AKA retirement central)” and any item that is still working. Why? If you mess with something, say a retirement program and things go wrong you will be blamed. Even though Social Security is in a bad way and the Medicare payments are escalating, there is no call to fix it. You cannot be a Knight in shinning armor unless there is a Dragon. So why fix it if it isn’t broke? In effect, your Congressman isn’t going to do a damn thing. Inaction will keep him or her re-elected. To face the problems, realistically would be a grand vendetta, but in reality it would be political suicide. So what do we have to look forward to? Answer, a country that might be fed up with Democracy. It happened to the German Republic in the 1930’s, voting got them nowhere. They threw the bums (Legislative body) out the hard way. 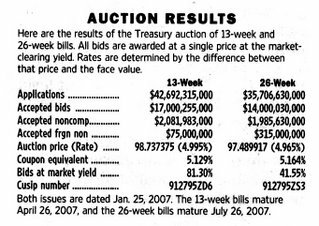 Every Monday, the Treasury holds an auction for 90 dayT-Bills. There are two ways to purchase the bills; Competitive and Non Competitive (a non competitive bidder accepts the average price of the Competitive bids selected). Here is pretty much how it works. The Treasury figures out how much they want to sell that day. They add up the Noncompetitive bids and subtract them from the total desired. Then they examine the Competitive bids. They accept the lowest interest rates offered by the Competitive bids until they reach the desired total. 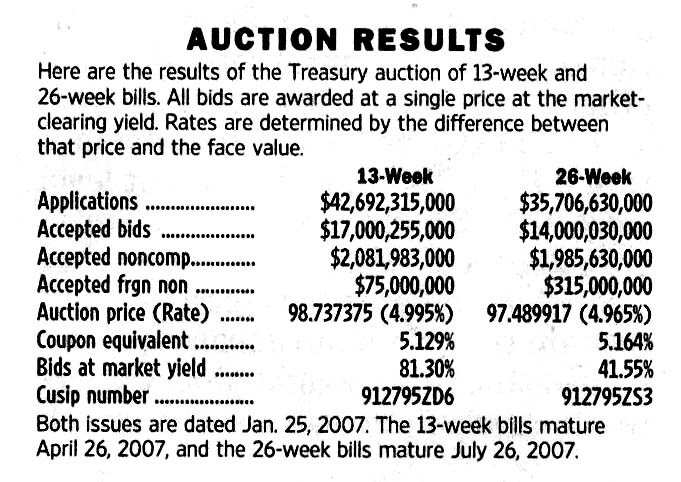 Lets look at the auction results for 13 week T-bill for last Monday’s auction. The thing to really notice is the total applications. In this case, over 42 billion was offered and only 17 billion was accepted. There is a lot of money out there looking for a home. There is also “Accepted foreign noncompetitive.” The 26 week had a healthy chunk of foreign interest 300 million vs. the 75 million for the 13 week. As long as total bids is larger than the amount needed, the Treasury is somewhat secure. If some of the Competitive bid players were to leave the market, the interest rates accepted would probably shift higher. The quality of Treasury’s is not in question. But, examine the plethora of housing loans that seem to be written at about 6.25% interest, something is quite disturbing. The added risk factor is not reflected in the rates being charged. Investors are willing to accept higher risk for less premium. It looks as if the inexperience Mutual Fund money manager has gotten “experience.” The only problem, there hasn’t been a real melt down to show these “seasoned” investors what the real world can be like. Think about it from a money manager’s view, they have been doing this for 15 years. So they ought to know what they are doing, don’t you think? From the spread between the two we can deduce two things. One, the 13 week T Bill interest rate is determined by competitive bidding. And two, something is out of whack with the home loan interest rate. 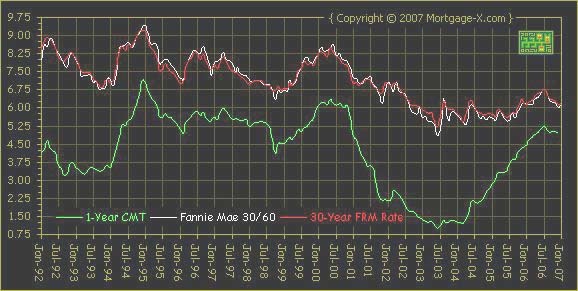 Does it really make sense that a 13 week T-Bill and a 30 year mortgage only have one percent of risk between them. Didn't Greenspan call this a Conundrum? What is plain, is that the dynamics that got us to this point in time, are not going to stay in place forever, something is going to snap. When you are headed for foreclosure, there are several different options you can take. Short Pay is one of them. The client gives the bank the house and gets out of the loop. This isn’t where you drive up to the bank and throw them the keys and you’re home free. Here is a link to a good info post on it: Short Pay. There is an effort involved and it could preserve your credit, but that seems rather iffy. The odd thing here is the concept of avoiding the Notice of Default, the NOD. I brought this up in an earlier article Forclosure vs Bankruptcy. The e-mailer in that article that I quoted gave me a name of an attorney to contact about the thriving Short Pay play. The lawyer never answered my emails so I left most of what was in the email out of the post. The email stated that the attorney had done over 90 of these in the past few months. That’s quite a few. Question: One lawyer does 90 in a couple of months? Are NOD’s getting a little Passé? If we go back to my first link, you begin to realize the unfolding problem. There are borrowers out there that have backed themselves into a corner. They can’t get the special deal, the short pay, that others got. • Question: I believe that in California, the loan is secured by the property, so the bank cannot go after your assets to make you pay the remaining balance of the loan. • Actually, this is a good example of a misnomer in the foreclosure arena. There are no deficiency rights in California for Purchase Money Loans. This is the loan you obtained in order to purchase the property. Once you refinance the property, take out an equity line of credit, obtain a consumer loan that is secured by the property, this rule no longer applies. The lender has the right to go after you in a deficiency judgment, even if a senior lien holder takes the property back and a junior loses his security instrument. Translation: HELOC or REFI= kiss your whatever good-by! A lot of homeowners can’t sell for what they perceive as a fair price and are starting to resort to “plan B.” Rent the place out. It sounds easy doesn’t it? The best route to take is having it professionally managed. Management fees are about 15% of the monthly rental amount plus a fee for getting the new renter. The prospective renter will be screened by the rental company and they will be able to give the owner a ball park figure on what it will rent for (it might not be a figure they want to hear). Since the owner is already negative, the management fee is probably out. Imagine what happens next. Let’s figure it isn’t going to get too bad, maybe just a couple of dogs and cats and 2 or 3 kids with crayons. Maybe a couple of college kids who like to party. In Southern California coming up with a first and last months rent (deposit) can be a real obstacle. On a $2,000 dollar rental, the tenant needs $4,000 up front to move in. So there is a definite issue here with the quality of renters, a lot of whom are living from paycheck to paycheck. Is the rent going to be on time? Will the check bounce? Why are there 10 cars in front of the house after they move in? Is it being sublet? If the owner is diligent, it can work out OK. Budget about one month’s rent for yearly repairs, water heater, sprinkler system, air conditioning, etc. But if the owner is having money problems already, this could be the beginning of the end. The biggest item that has to be considered is the owner’s vulnerability. If the renter is of poor quality and the owner has a negative cash flow on the property, the hole is being dug deeper. It’s not a crime to stiff the landlord on the rent, in some states it can take 3 months to evict the tenant. There isn’t much recourse to the landlord other than chalk it up to experience. Remember one thing about rentals from the landlord perspective. It doesn't matter what the rent being charge is, it matters on how many months out of the year it is vacant. You divide total rent received by 12 months to determine the actual rental rate. The actual rental rate for a house advertised at $2,000 per month that is vacant 4 months is actually $1,333 per month. The landlord does not determine the rental rate, he only determines the months of vacancy. I wish any future landlords the best of luck, its not easy, but well worth the time, if you purchase the rental at a decent price. It looks as if the housing blogger’s are ready to deliver the "coup de grace." Real estate is starting to drop in price. This impending collapse of housing has other implications. Not all of them are obvious. Everyone who files bankruptcy or goes into foreclosure will be virtually eliminated from purchasing a home for years. The list of potential buyers of real estate will be cut drastically. That’s good news for rentals. As a lending institution picks up more REO’s, you’ll see their lending standards become more selective. As markets drop, even the new lending standards will produce losses. The first to enjoy the new banking standards will probably be the Condo owners. Lenders will not want to touch this class of properties. I sold one on North River Rd, Oceanside in 2000 for $45,000, prices now are at $260,000, 850 sq ft. Indirectly in the fracas, would be the real estate appraiser. 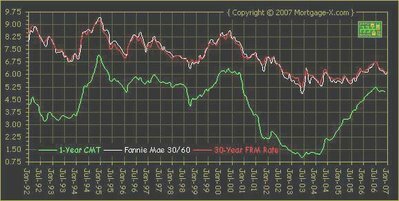 In order to salvage an image of creditability, without being held responsible for the whole mess, they would have to find an appraisal method that could be sanctioned by the banks; quite possibly a roll back to the 1999 year pre bubble values. These values would be low, but lending institutions would be comfortable that the loan isn’t going to turn into an REO. I’ve heard that 70% of the US population changes their address every 5 years. If you bought before 2003, it looks as if you still have that option and can pick up and move. Otherwise enjoy your financial mouse trap. Congress (god bless those whose good intensions seem to screw up everything) removed the capital gains tax on selling your home. Well, that also removes the deduction for a loss. Add on top of that the 1099 you get from the bank for a short sale of your home. So if you do it this year, the 1099 might be for $80,000. Wait till next year and it could be $180,000 and maybe $300,000 if you last a year longer. RealtyTrac.com is showing 3,462 Bank REO’s for San Diego right now. San Diego realtors didn’t sell 3,000 houses last month. This pretty much suggests that the lenders are feeling some pain. Couple this with the outright real estate fraud in the Temecula area reported by the North County Times, last week, and the outlook gets worse. If you picture a tree, and each leaf is a house and the branches and the trunk are our financial institutions, you begin to realize the size of the problem. If you picture a baby boomer standing on a three legged stool (labeled “retirement fund”) and imagine kicking out one of the legs, it doesn’t bode well. Interest rates could go through the roof. Forget Bernenke and the Fed Funds Rate. That rate has to do with the loaning of funds to a Bank on an overnight basis when a couple of million dollars in checks hang up for some reason. The Fed covers the bank for the night and gets a check for a couple of hundred the next day. My eyes gloss over whenever someone decides to enlighten me on the significance of the Fed Funds Rate, they raised the rate 17 times and the RE loan rate went up one half point. What we are talking about are big foreign investors trying to get their money out of US banks. At this point, I could be accused of forecasting Gloom and Doom. But look at it from a different light. From 1980 to now, everything has gone up for no real reason. EVERYONE was a successful investor. Now the mood seems to be changing, and it’s a group sort of thing. I believe that the herd is about to turn. What we are about to witness, is reminiscent of 1929. There was an article in the San Diego Tribune paper yesterday Jan 13, on the new television factory being built in Rosarito Beach in Baja, California. It’s a 600,000 square foot factory with an estimated projected output of high definition televisions at 200,000 per month. I imagine to the uniformed, Baja, California is considered part of the United States (so much for high school geography). It’s rather odd that the word Mexico never came up in the article. 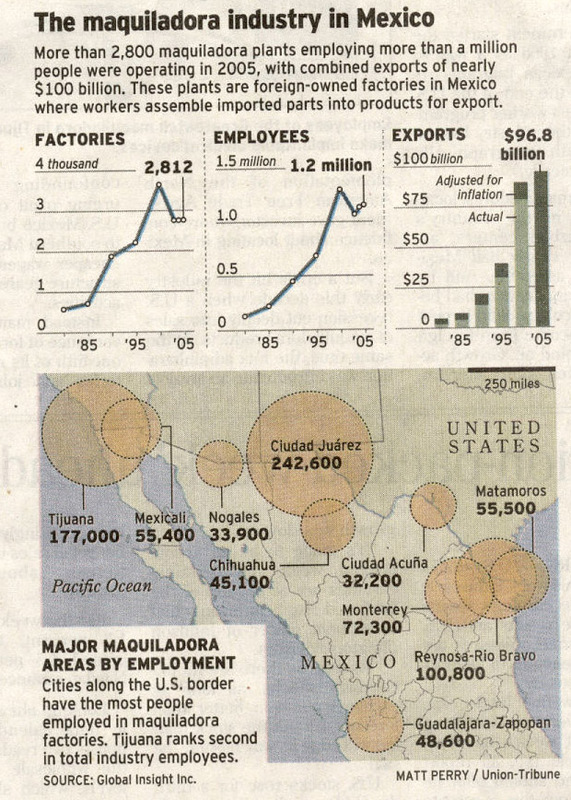 Then today in the same paper, business section, it shows a picture of a large warehouse under construction in Tijuana. It lists various locations along the Mexican border and says that there are presently about 1,236,000 workers in the 3,000 plants averaging $2.30 per hour. Total product for export was just under 100 billion in 2005. Let me see if we have this right. Daddy is in the United States picking tomatoes in Fresno at $8.00 per hour and his kids are in a Mexican factory producing wide screen TV’s for $2.30 an hour. Right? --Wrong! Most kids are smarter than that, they’ll go with dad. What do you have? A lot of people in Mexico with absolutely nothing, and this is their first step towards the promised land. A coyote will charge $500 to $2,000 to get them across the border. Go for it!!! One year in the wide screen plant, and the next year, relax in the "California Triangle" (Fresno to Bakersfield to Modesto). Think that I am kidding about the "California Triangle?" Drive the area, and count the number of English speaking radio stations FM and AM—I never get past 3. What’s it all boil down to? Our labor costs are far more expensive than foreign countries. Manufacturing jobs are leaving the country in large scale. Ross Perot, back in his quest to become President, often mentioned the “Giant Sucking Sound,” in reference to the proposed free trade with Mexico. 200,000 wide screen television sets per month, and everything goes “high definition” in 2009, as per Congressional Decree. Mind boggling isn’t it? Easy monthly payments, and did I mention, they want $500 to mount it to your wall? 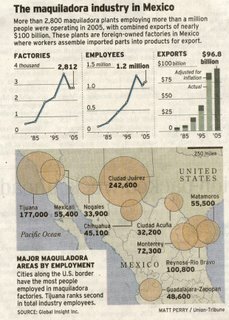 I wonder when Boeing will make the decision to move to Mexico? Its getting to be the time of year (tax time) to get the money together for your IRA tax deduction. The IRA is kind of a forced tax deduction, whereas the mutual fund deduction is admitting that you don't have the time to follow your investments. Let's maybe change your thinking with a few rules. Rule 1, if you are under 45 years of age, start by taking personally control of your investments. There is no one out there that has your best interests at heart more than you do. Rule two: if your goal is to get rich, stick with your IRA and mutual fund, you'll go broke trying to get rich. Rule three: money is a tool and use it as such, it can work for you. Use it for college, training, rental real estate, not for the wide screen TV. Rule Four: Everyone wants your money. Rule five: Successfully managing your money will keep your family together. That might sound very obvious, but if you screw up your finances, you'll never get to the "family together" part. Not to really be down and out about IRA and Mutual Fund managers, but you have to realize, that there is never going to be the call by them that says "Get out of the market, it's too risky." Even if they realized the risk and went to cash, their yield would drop. Then their customers would move to higher leveraged returns and leave them in the dust. As a fund manager, you have to play with the "petal pushed to the metal." Your salary is determined by return on equity, not common sense. This philosophy works exceedingly well around tax time, there is a lot of money coming to market for investment purposes. If you freeze the investment market in time for one second and examine it, you will realize that someone already owns everything. At the next moment in time, that will also be true, but since money is coming into the market, more is being paid for less of the item. At some point when stock prices start to decline, the logic for upward returns will vanish. At this point, your IRA or Mutual fund will be selling to cover redemptions. Another thing to notice is the Insured Account Boilerplate. Your account is insured for umteen million dollars, but your investments are not insured against a loss. If the fund manager Skip's to Brazil you are insured. If he invests in his uncles new potato peeler and it goes broke, tough luck! The other thing that I have noticed about my IRA, is that there is a 5% transfer fee. So if I decided to switch to another provider with funds not in the account for 5 years, I get charged. The reason this came up is because I noticed that my bank was offering FDIC insured retirement accounts that are insured up to $250,000 per individual. I am more interested in cash in the bank considering the present conditions. My preferred vehicle of ownership is Treasury Bills which cost nothing to buy. Here is a link Treasury Direct But if you are stuck with and IRA or whatever, there is the option to secure it in a better way through a bank with FDIC insurance. Here is a link to the site FDIC Info. I don't normally plug banks, but Union Bank of California is one to consider. They cater to the over 50 "old farts," and I guess I have to fess up to being one of them. I'm sure that there are others and maybe someone will post a comment as to other banks offering the same investment opportunities. I started this blog in May of 2006 and from my perspective, it should take two years before most people will realize that we are in a major depression. Well, we are almost half way there. It's kind of like a rear view mirror perspective, we'll see it only after it's behind us. Real estate is not doing very well. I saw a new word the other day that was referring to the current status of property for sale "fugly." Two four letter words combined to express a diagnosis that is a bit on the strong side. A lot of the issues point to problems further ahead, foreclosure's, refinancing and bankruptcy. These are all real estate related. The organization that I work for has installed over 2 million dollars worth of computer equipment last year, and all of it says "Made in China." Is there anyone in the United States producing anything besides food that is making a profit? Then you hear the speculation of the DJIA going to 20,000. I think that we have a market where speculation is King and Reason has no Consort. Very few companies even pay a dividend that would support their current price on the DJIA. Retirement time is close for the baby boomer's and if it doesn't pay a dividend, why hold it? Questions abound unanswered. Why worry the market is going up, Right! "Up what?" is question to ask! Your IRA could have a sick call like back in 2001. The 50% haircut wasn't about hair salons.